It would be regrettable were this year to end without some commemoration of the 250th anniversary of the death of the Reverend Stephen Hales DD, FRS. Clinicians and virtually all biologists rely on some aspect of his research. While most of us work within a relatively narrow range, Hales made significant contributions to plant and animal physiology on which we still depend, while also contributing to chemistry , inventing ventilation systems and winnowing machines  and an instrument to remove urinary calculi through the urethra , and publishing papers on the causes of earthquakes  and the control of fires . The very full scientific life of Stephen Hales has much to tell us about the modern practice of science. Stephen Hales was born in 1677 in Bekesbourne, Kent, and went up to Cambridge in 1696, where he was elected to a Fellowship at Corpus Christi College in 1702. He was appointed to the parish of Teddington, Middlesex, in 1708 and remained there for much of every year until his death in 1761. He had married in about 1719, but his wife died a year later and he never remarried. He was elected to the Royal Society in 1718 and was awarded its Copley Medal in 1739 for his "experiments towards the discovery of medicines for dissolving the stone, and preservatives for keeping meat at sea". In 1753 he was elected a foreign member of the Académie Royale des Sciences. Hales is buried beneath the tower of his church in Teddington, although a monument in Westminster Abbey was erected in his memory at the instigation of the Princess of Wales to whom he acted as chaplain [6, 7]. The experimental approach for which Hales became especially remarkable started in collaboration with William Stuckeley during his Fellowship. In his subsequent work he kept meticulous records of both the methods employed and the observations as is clear from his published work. However, he did not simply observe and catalogue as was common at the time (for example Linnaeus1 was a contemporary), he also made measurements and then used them and his data to perform calculations. This is another feature of biological research that 1 Sachs [8: 89] wrote that "[i]t was not Linnaeus' habit to occupy himself with what we should call an enquiry; whatever escaped the first critical glance he left quietly alone; it did not occur to him to examine into the causes of the phenomena that interested him; he classified them and had done with them ... Linnaeus was in fact a dangerous guide for weak minds, for his curious logic, among the worst to be met with in the scholastic writers, was combined with the most brilliant powers of description ...". Using slightly less forthright language, Miall [9: 329-336] argued that Linnaeus contributed significantly to the "...temporary and partial arrest of development ..." of a century of biological science. This may prompt some to think of a powerful modern parallel. Medical Physiology Online Exploring the logic of life Brown S and Simcock DC. 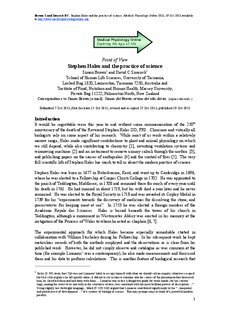 Stephen Hales and the practice of science. Medical Physiology Online 2011; 19 Oct 2011 available at http://www.medicalphysiologyonline.org Medical Physiology Online [MPO] ISSN 1985-4811 http://www.medicalphysiologyonline.org 2 has declined with the dwindling mathematical skills of biologists, although computer-assisted statistical testing proliferates. Here, we provide a brief survey of four areas of interest to Stephen Hales: plant physiology, the chemistry of air, animal physiology and the ventilation of confined spaces. We then consider the wider significance of his extraordinary body of work.